If there was no Rhine, Europe as we know it would probably be a bit more of a boring place. For centuries, countless thriving cities have developed at the river banks of this historic waterway: Cologne, Rotterdam, Basel and many more. I love exploring cities where the history is still present, where nature is close by and where I can feel a lively vibe. These criteria perfectly describe Schaffhausen, a quaint town along the Rhine. In fact, thanks to the nearby Rhine falls, which are Europe's largest waterfalls, Schaffhausen scores really big in the nature department. 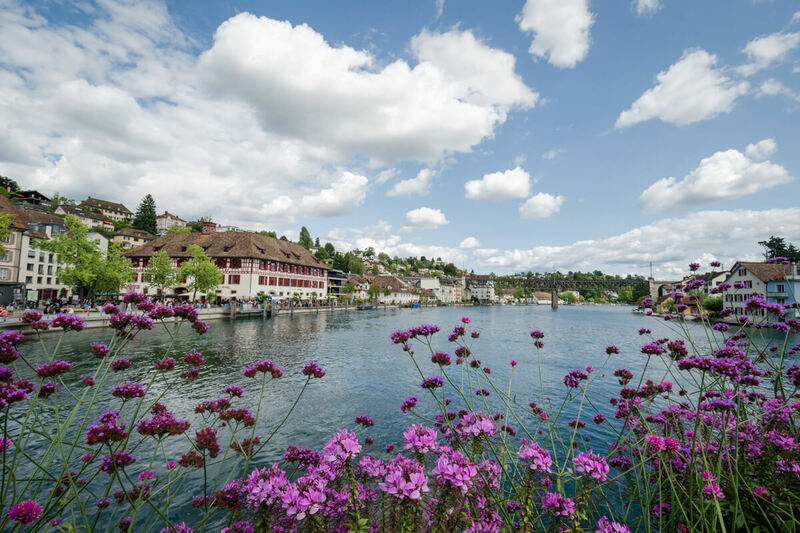 On a warm summer weekend, I headed to Switzerland's north as I wanted to "meet" Schaffhausen from close up. I had a wonderful time there and would love to share some tips to make your visit to Schaffhausen an unforgettable one. Before the development of the railway system, the River Rhine was used extensively for trading of goods. Right before the Rhine falls, ships had no other choice but to stop to unload. At this very spot, a thriving city was born. Still today, Schaffhausen is a feast for your eyes. The cobble stone alleys are lined with centuries old, colorful buildings. Each and every house in the old town has its own look with unique decorations and even special names. Keep your eyes wide open because with every gorgeous wall painting and bay window, you will find yourself deeper and deeper back in time. Nestled atop a hill above Schaffhausen and surrounded by fruity vineyards and a deer garden, there is a round, massive 16th century fortress. The Munot is quite literally the pride and joy of the people of Schaffhausen. The Munot is one of the city's main attractions as well as a beloved hangout and celebration spot. From the old town near the Rhine, take the stairs to the top. Treat yourself with the colors and smells of the rose garden before climbing the swirling ramp inside the fortress. From the very top, you will be rewarded with splendid views over the city and the Rhine river. And if you listen carefully at 9 PM, you will hear a guard ringing the tower's bell: This is a tradition kept alive from the Middle Ages! What would be a proper summer day without a delicious scoop of ice cream? 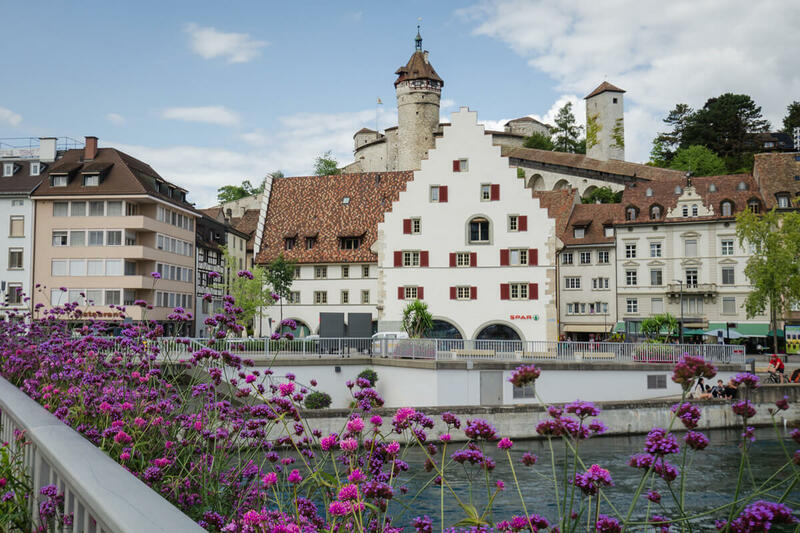 To find a superb one in Schaffhausen, just follow all the people with gelati in their hands and wait until you reach a small side street in the old town where a bubbly crowd is waiting for the most beloved homemade ice cream in town – El Bertin Glacé. With 24 different kinds of the cold, delicious treat including some seasonal specials, El Bertin makes both kids and adults burst with excitement. There is a cozy cafe with a few seats but you can also head to the riverside, a one minute walk, to join all the locals who like to soak in the sun and savour a long awaited ice cream. My choice? Avocado-cucumber with Schoggi-Amaretto - yumm! After walking the old town and climbing the Munot, I was longing for a refreshing dip in the water. Take my advice and check out the hip Rhybadi, a natural swimming pool that is also the biggest and oldest one of its kind in Switzerland. Since 1870, many locals have learned to swim there, yet this public bath still retains a cool, contemporary vibe. It is the best place to cool off, relax or join one of the organized events such as yoga on Tuesdays. This lovely "Badi" is close to the city center and offers all the necessary amenities: Showers, changing rooms and even a bar. Thanks to the river being fenced off, I felt safe swimming in the stream. Because who would want to end up on the cover of the local newspaper because they floated down the famous falls? Spoiler alert! When approaching Schaffhausen by train, pay attention to your right hand side... 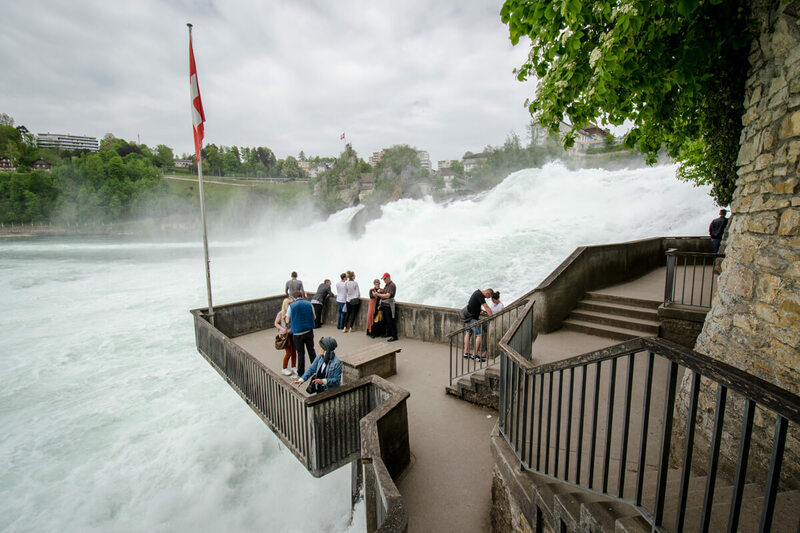 The Rhine falls are quite a jaw-dropping welcome sign for Schaffhausen! With an average of 700'000 liters of water gushing down every second, these falls with their wild roar will surely leave a lasting impression. Warm evenings call for a dinner outside. In Schaffhausen, I can hardly think of a better restaurant than the terrace at the Güterhof. This former warehouse is set right at the riverside. And after more than 200 years, the Güterhof has been given a second life with a fine dining restaurant, an elegant lounge, an outdoor deck and even a sushi bar on board. In a way, it feels a bit exotic to be eating there. That's because you can watch people and trace the ships passing by, all the while being secluded by palm trees. What makes the Güterhof my favorite choice is the fusion of local and international cuisine, as well as the magnificent sun set over the Rhine. My advice: Try their Riesling wine soup along with a glass of white house wine. The latter is a mix of three grapes that grow on the hill underneath the Munot fortress. It is a heavenly combination! For a total rejuvenation, head to the vast arcona LIVING spa area with saunas, steam baths and a Turkish hammam. 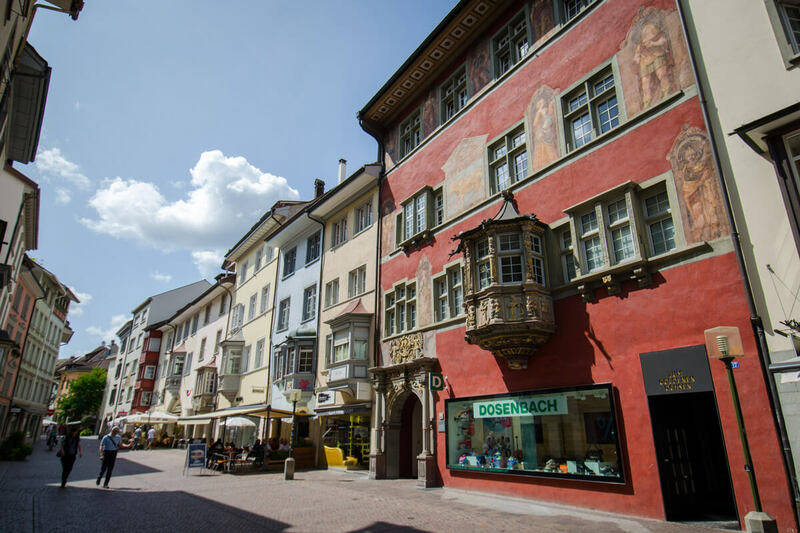 The next morning, enjoy an unhurried breakfast at the hotel's restaurant before hitting the streets of Schaffhausen once more. On my way back to Bern, I dwell in memories from my overnight stay in Schaffhausen. This town has a way of throwing you back in time. Like no other place, it introduces visitors to life along the Rhine river. And with all those delicious foods, wines and treats, Schaffhausen makes sure that we return! So, what are your plans for next weekend? … or do some people watching at one of the many cafés. Here’s a town square with a fountain. Many buildings are adorned with elaborate art. A nice perspective from across the bridge down by the Rhine. A view of Schaffhausen’s old town. Down by the Rhine where the Güterhof is located. Here's another template for a weekend getaway to Schaffhausen.